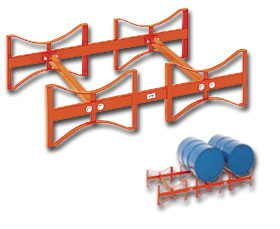 Shop forÂ drum pallet racks at Material Handling Solutions. 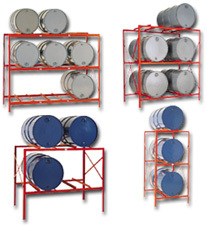 These racks are designed to safely store 30 and 55 gallon industrial drums. Our drum pallet racks and portable drum racks feature 4-way access with a forklift and can be stacked up to 4 high. They are welded and bolted for extra supporting power and are easy to assemble. 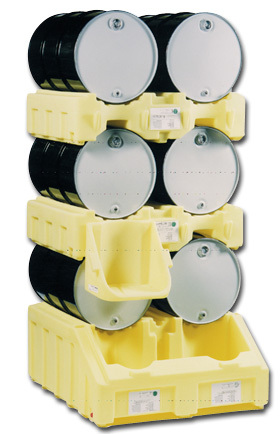 Our drum racks are designed for handling and storing 30 & 55 gallon drums. They offer superior strength and are made of heavy duty steel angles. They feature front and rear forklift entry. 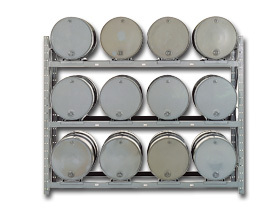 We also have poly rack drum systems. 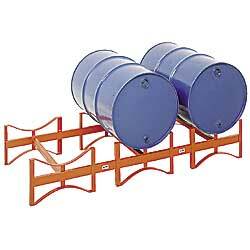 Our poly rack systems are made of polyethylene and each level holds two 55 gallon drums. They feature deep dispensing wells which holds 5 gallon pails for spills and both sides of unit contains drain plugs. The system consists of 3 levels. Spills from the second and third level drain into the dispensing well. Our poly rack system has a capacity of 2400 lbs and is easily assembled. We offer many other types of material handling equipment. Please check out our large selection of various types of lockers and cantilever racks to utilize your facilityâ€™s space to the fullest capacity. We have a huge inventory of pallet racks and we can usually ship any order within 96 hours. Call us toll free with any questions you may have and one of our specialists will help you find what you are looking for.